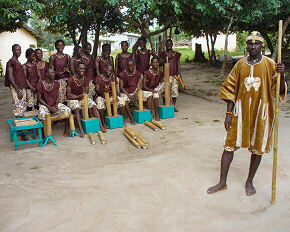 The first people to bring the bamboo music to Mesomagor were a family from Gomoa Odinna (located in the Central Region). The music soon became very popular as a form of entertainment, especially with the youth. When the Kakum Park project began many of the young people had to leave Mesomagor to find work elsewhere, thus the bamboo orchestra broke down. 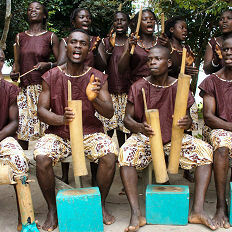 In early 1994, Bismark Amoah, the current group leader, wanted to revitalize the Kukyekukyeku Bamboo Orchestra (KBO). He left Cape Coast and returned to Mesomagor, where he found a lot of interest among his peers. 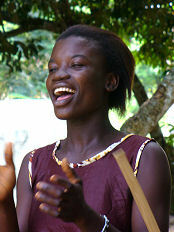 With the help of AGORO/CILTAD, the group was organized and learned more drumming and dancing. 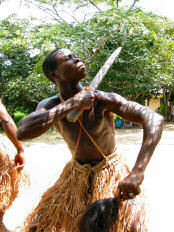 They perform war dances, story dances, modern and creative dances. If you would like to see a performance you can come to Mesomagor or invite the KBO to perform at your location. 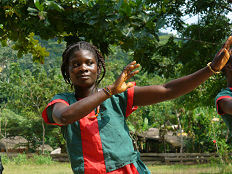 KBO members are also able to teach traditional drumming and dancing using the bamboo instruments. We can teach to outside groups or individuals or you can stay with us in our village, where we can also entertain you with Ananse storytelling (traditional and funny stories).